It is important to receive an annual flu vaccine to protect yourself and the other people in your community from contracting the flu and prevent the spread of this potentially dangerous disease. Seasonal influenza, commonly called "the flu" is caused by influenza viruses, which infect the respiratory tract (i.e., the nose, throat, lungs). Unlike many other viral respiratory infections, such as the common cold, the flu can cause severe illness and life-threatening complications in many people. It is estimated that in the United States, each year on average 5% to 20% of the population gets the flu and more than 200,000 people are hospitalized from seasonal flu-related complications. Flu seasons are unpredictable and can be severe. Over a period of 30 years, between 1976 and 2006, estimates of flu-associated deaths in the United States range from a low of about 3,000 to a high of about 49,000 people. Some people, such as older people, young children, pregnant women, and people with certain health conditions, are at high risk for serious flu complications. The best way to prevent seasonal flu is by getting a flu vaccination each year. Fever, chills, fatigue, body aches, sore throat, and headache are common symptoms of flu. Not everyone with flu will have a fever. The flu can cause mild to severe illness, and at times can lead to death. The flu is different from a cold. The flu usually comes on suddenly. 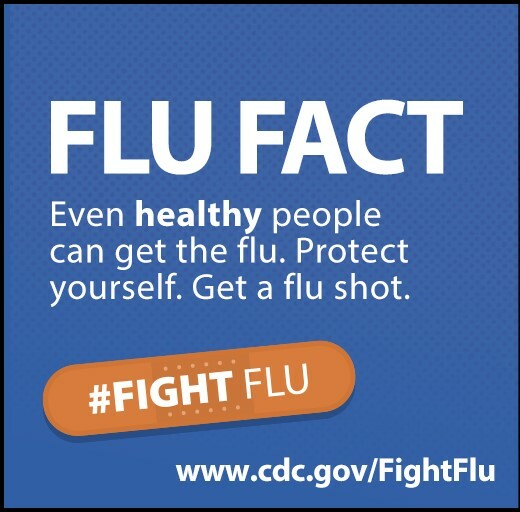 For information about flu symptoms, see CDC Flu Symptoms & Severity. In the United States, flu season occurs in the fall and winter. The peak of flu season has occurred anywhere from late November through March. The overall health impact (e.g., infections, hospitalizations, and deaths) of a flu season varies from year to year. CDC monitors circulating flu viruses and their related disease activity and provides influenza reports (called "FluView") each week from October through May. See Weekly U.S. Influenza Summary Update. Flu surveillance in the U.S. continues through the summer months with condensed reports available. Not necessarily. Several studies conducted over different flu seasons and involving different influenza viruses and types of flu vaccine have shown that a person's protective antibody against influenza viruses declines over the course of a year after vaccination and infection, particularly in the elderly. So a flu shot given during one season, or an infection acquired during one season, may not provide adequate protection through later seasons. The decline in protective antibody against the flu that occurs after vaccination or after flu infection may be influenced by several factors, including a person's age, the antigen used in the vaccine, and the person's health situation (for example, chronic health conditions that weaken the immune system may have an impact).